Yesterday, President Bush visited Alexandria for the second time in his eight year tenure. He came here to speak, in a closed-door session, with regional business executives on our “Main Street” economy, and while he was here, he managed to bestow a volunteer award on a local educator and participate in a private meeting with the families of fallen soldiers. 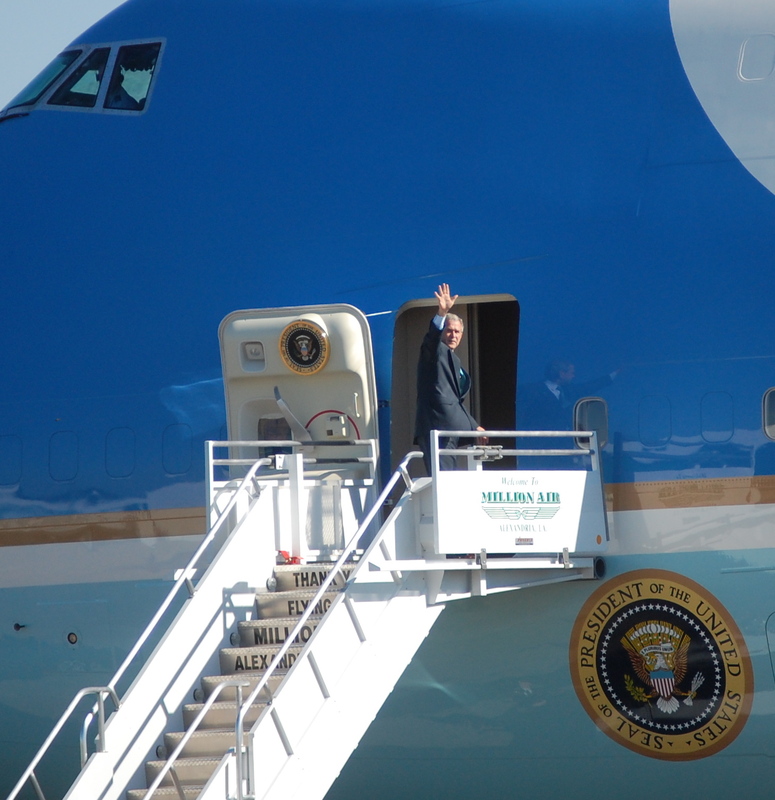 Obviously, it’s not every day that Alexandria plays host to a sitting United States President, and we’re not accustomed to Air Force One or Presidential motorcades. But suffice it to say, hundreds of people showed up to view the spectacle and catch a glimpse of Mr. Bush. CenLamar somehow, serendipitously, had a man on the field, who was able to gather some great exclusive photographs. Godspeed, Mr. President. We hardly knew you. 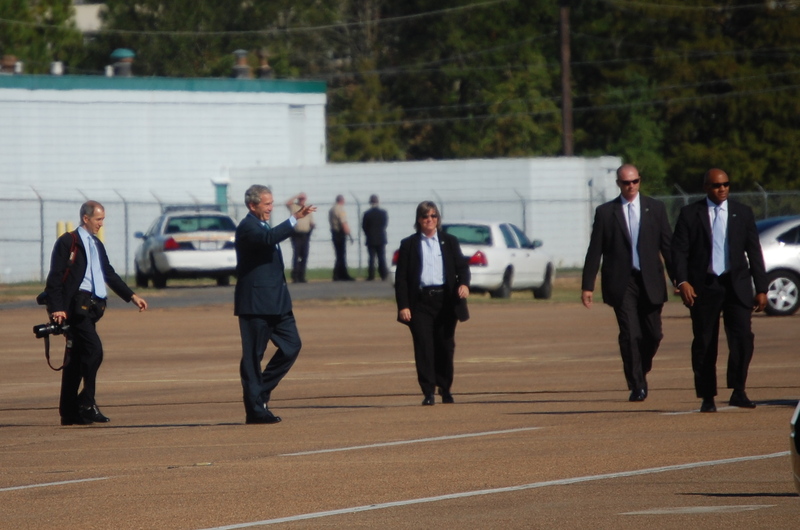 In all seriousness, Presidential visits are strange ceremonies, regardless of who is President. Still, Alexandrians have always enjoyed playing host, and despite our numerous and substantial disagreements with Mr. Bush here on CenLamar, it was still pretty cool to see a Presidential motorcade buzz through Downtown Alexandria. That said, I wish the White House would have decided to make Mr. Bush’s appearance a “public event.” Instead, Mr. Bush spent the bulk of his time at the local Chamber of Commerce conference room, meeting with regional business executives. The media and local elected officials were excluded from participating. Though I believe this probably wasn’t a directive of the White House (at least with respect to local government officials), it is difficult to assess the real purpose of a closed door powwow on our local economy with an outgoing President and without any local government or public participation. I have to say: With all due respect to anyone who believes Alexandria is somehow a microcosm or an example of the current struggles of the rest of our great country, you may want to book a flight to a state like California or Florida or even Texas. A couple of days ago, I was in Southern California, and unlike Alexandria, Southern California is graffitied with “For Sale: Foreclosure” signs. This latest economic crisis has a lot to do with overextending credit in order to build homes in suburban neighborhoods and well-to-do enclaves. Obviously, we’re not experiencing those conditions, which is why the message of the day here in Alexandria was: Community banks are strong. Well, of course they are. Thankfully, we live in a community largely unaffected by the subprime crisis. And while that’s great for those of us in Central Louisiana, it’s no reason to rest on our laurels. We didn’t overbuild because, in all honesty, we couldn’t afford to overbuild (though we did sprawl unnecessarily). The average household income in Central Louisiana is still woefully below the national average. Our crisis is not current, but it is forthcoming. Our workforce is aging; many, if not most, in our productive workforce will reach retirement in the next four to five years. During the past few decades, business leaders have worked diligently to attract industries to help mitigate this impending crisis, but there’s a problem: Our local economy may be too reliant on a 20th century model. Like many small cities, our continued success depends on our ability to attract sustainable 21st century jobs– and to build a community around a 21st century model. In my humble opinion, it would be unreasonable and absurd for anyone in our local media to suggest otherwise. We are not a microcosm; we are dealing with our own unique set of circumstances and conditions. Any attempt to analogize Alexandria with the frontlines of this crisis is misbegotten, and any attempt to paint a completely rosy picture to the President of the United States neglects the conditions on the ground. Still, it was a unusual and memorable day for those of us in Alexandria, and we’re always happy and honored to play host to a sitting United States President.